BALTIMORE (CNS) — Will pastoral leaders simply parrot Pope Francis as they explore new ways to build up the church, or truly “deny” themselves and follow the example of Christ, regardless of the consequences? That was the challenge described by Baltimore Archbishop William E. Lori Feb. 17 during a late-afternoon Mass on day two of the sixth annual Mid-Atlantic Congress. He began his homily with a comparison of his parents, typical do-it-yourself members of the Greatest Generation, and the builders of the Tower of Babel. Whereas the former built and remodeled a house in southern Indiana that was founded “on faith, on discipleship and self-giving love,” the ancient builders “sought to build independently of God and even in defiance of God,” he said. How does that contrast relate to the reorganizations being undertaken by archdioceses and dioceses around the nation, such as the Archdiocese of Baltimore’s pastorate planning process? “As we go about the work of pastoral planning, whether at the diocesan or parish level, we can fall into the trap of thinking about this project solely in terms of managing finances, personnel and buildings,” the archbishop said. “We can sometimes adopt the language of the business world without pausing to ‘baptize’ it sufficiently — giving the process only a patina of evangelization. “Sometimes we repeat churchy language without really grasping what it means. How many sentences are constructed using the words of Pope Francis — ‘encounter, ‘accompaniment,’ ‘discernment’ — yet they lead to nothing. “The folks at Babel sought to gain the whole world and lost everything,” Archbishop Lori said. “We are called to lose everything for the sake of our gaining Christ — for we are convinced that we are blessed to the extent that we are his faithful witnesses. Concelebrants included retired Auxiliary Bishop Denis J. Madden and Auxiliary Bishop Adam J. Parker, both of Baltimore. 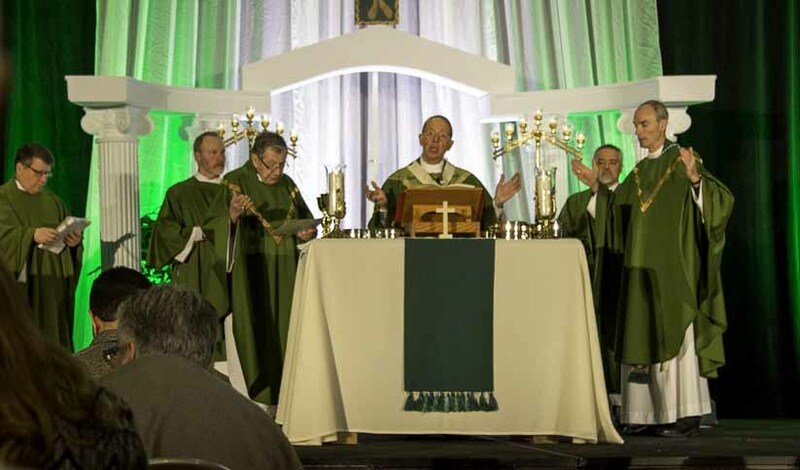 The Mid-Atlantic Congress attracted more than 1,400, including repeat attendees such as Amy Kanich, the director of campus ministry at Mount Aloysius College in Crescent, Pennsylvania, in the Diocese of Altoona-Johnstown. She praised not just the lessons brought by keynote speakers such as Sister Regina Marie of the Carmelite Sisters of the Most Sacred Heart of Los Angeles, but the spirit shared. “From morning assembly to adoration to the Eucharist, the initiative of the (Holy) Spirit is so woven into everything here,” Kanich told the Catholic Review, Baltimore’s archdiocesan news outlet. “I don’t know who plans this, but their heart is being called and informed.